Museum Meermanno will show more than five hundred miniature books in the small, but impressive exhibition ‘Xtra small’. Miniature books fit in the palm of your hand and sometimes even on the tip of your finger. 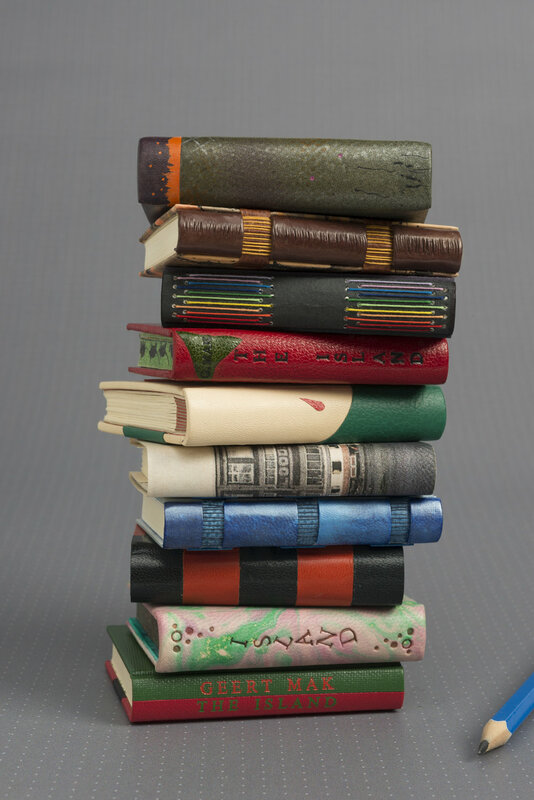 The small format is a challenge for book binders and printers. It is also an opportunity for them to display their expertise and dexterity. A really successful miniature book demands a high level of craftsmanship as well as a considerable degree of creativity, taste and refinement in the design and in the motifs and materials used. Museum Meermanno has always had a large collection of these tiny books, including the extraordinary Bloemhofje of 1673. Many modern examples are also part of the collection. This was expanded dramatically in 2012 with the Bibliotheca Thurkowiana Minor. This is a miniature library that contains 1550 little books including a miniature version of a clay tablet from 1800 BC. The museum will display this collection in the exhibition ‘Xtra small’ along with 120 additional unique examples. 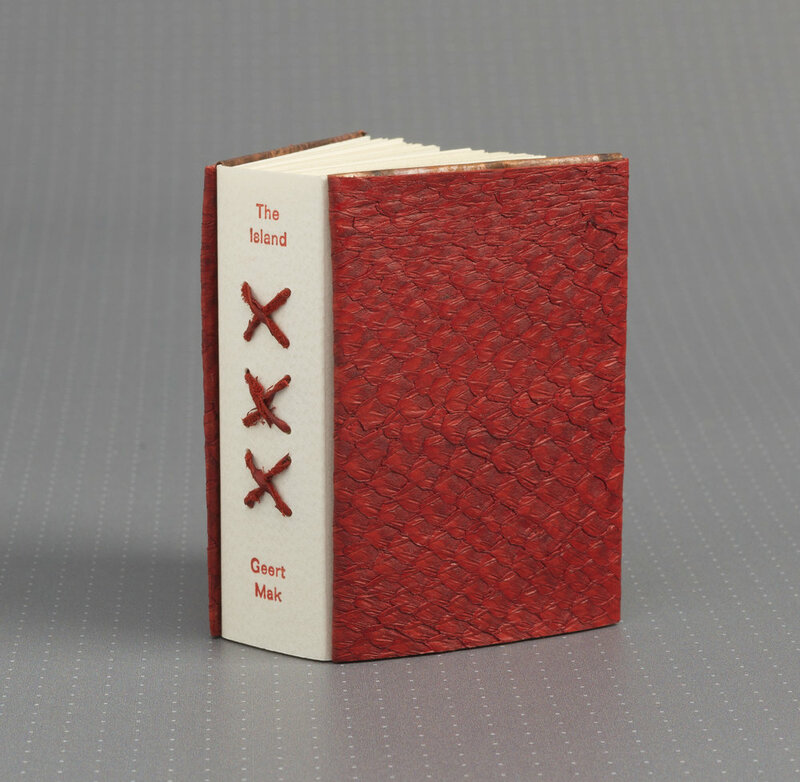 These were submitted for the International Miniature Bookbinding Competition 2017 organized by the Hand Bookbinding Foundation (www.stichting-handboekbinden.eu) together with the publisher De Buitenkant (www.uitgeverijdebuitenkant.nl) and Museum Meermanno at the end of 2016. The participants received the quires for the story “The Island” by Geert Mak, translated into English by Liz Waters. The Amsterdam artist Max Kisman provided illustrations for the text. The books had to conform to the so-called Bondy norm which meant the maximum height, width and thickness could be no more than 76.2mm. All of the submissions reflect the dedication and craftsmanship of their makers and come from all parts of Europe, Canada, the United States, China, Japan, Australia and New Zealand. The exhibition will be accompanied by an eponymous, English catalogue, designed by Peter Verheul of The Hague. The book, published by De Buitenkant, includes full-scale illustrations of all of the entries in the competition. The book appears on 1 October and can be bought for 12,50 euros at Museum Meermanno or can be ordered at De Buitenkant (www.uitgeverijdebuitenkant.nl). The museum is organizing a series of activities. Each Wednesday afternoon in October, the curator will open the miniature Thurkow library and show visitors special and secret hidden books. During The Hague Museum Night you can take part in a mini guided tour. Look at our website for additional activities.